Hello everyone! We are really on the Christmas countdown now, aren't we? I have much to do yet, and I don't know how soon I'll be able to post again before Christmas. Today I've decided to show you a few of the last minute cards I made (mass-production style), so that I could finish my cards and get them out. Minimal layers, accessories, and coloring...but still quite pretty. The stamps are all Lizzie Anne Designs which you may find at Gourmet Rubber Stamps. I love all 3 of them! Merry Christmas to you and your family! Such pretty cards. 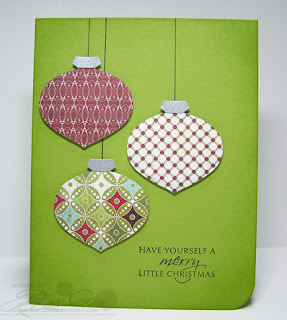 I need to try one of those ornament cards next year - love how they turn out. I still have 2 things to buy and I hope I'll take care of those today. We are in Seattle with my family. So nice to be here. These are all so lovely for reproducing! 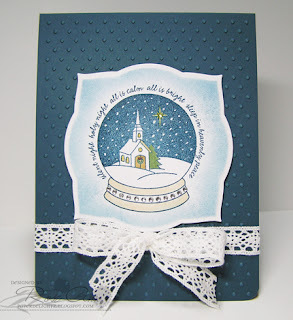 Love the pretty and delicate trim on your first card and your ornament card is so festive! Love all the cards Rose Ann. So sweet but wonderfully simple - my favs. Merry Christmas! Great cards Rose Ann! Wishing you and your family a blessed Christmas. 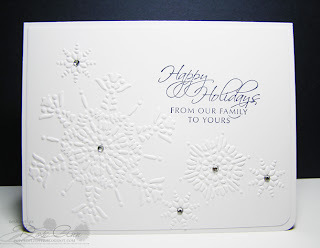 All three cards are fabulous, Rose Ann!!! 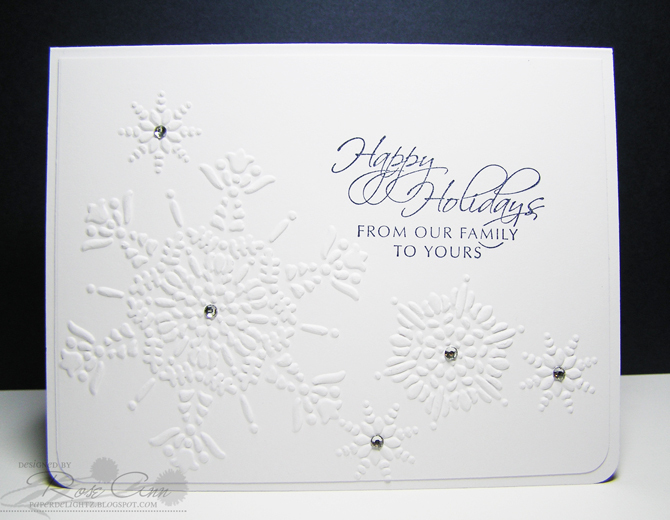 I had a hard time creating flat cards this year...I will sooo be casing your cards for next year!!! Pretty and elegant! My favorite is the ornaments card. Love the colors and the contrast of the silver at the top of the ornaments. These are all so lovely, Rose Ann! Each one is simple, yet so stunning! Merry Christmas!